American actor Michael Peña discusses how he worked with Robert Redford to enrich his character in the 2007 film Lions for Lambs. Q. How much of your character was there written on the page? Michael Pena: Robert Redford and I created a back-story, because that makes it easier, especially when it’s a character you can relate to. I remember growing up and seeing a kid die in front of me. I was in Chicago, my first week of High School, so you understand what the character is talking about. You’re in a war zone, you see people die, and probably half the kids I knew aren’t with us any more. At 25, to know half your friends have died without going to Iraq or Vietnam or whatever, it’s quite a telling tale. So you can bring that into the war. It’s not too different going those neighbourhoods and into a war zone. Q. How did that kid die? Michael Pena: A car was speeding. He got off the bus and a black car, we don’t know who was in it, hit him and knocked him about 100ft. He went down in a pool of blood. Q. You’ve worked with several liberal-minded directors. Do their beliefs mirror your own? Michael Pena: I tend to go with my own counsel. I’m an artist and try and do the stories that interest me the most. I don’t know if it’s because they are in the news so much, but these are the films that captured my imagination. And it doesn’t hurt that Tom Cruise, Meryl Streep and Robert Redford are all involved. And with something like World Trade Center, that was just to work with Oliver Stone. I loved Platoon, Born of the Fourth of July and Wall Street. I’m working with him again in December [on Pinkville], we’re shooting in Thailand. It’s about the My Lai Massacre in Vietnam. I play one of the bad guys. Q. How do Robert Redford and Clint Eastwood compare as directors? Michael Pena: They’re very similar, although I think Bob talks about the scene with you a little more beforehand. But they both hire people that they know are going to come in very well prepared. Clint might have said something like ‘directing is 80 per cent casting’, and the only reason he does three takes is because if he can’t get the actors doing what he wants in three takes he thinks either that he’s not directing right or, more probably, he’s got the wrong person. While Bob tends to talk a little more. But they’re very both very different from Oliver Stone. He’s more like Beethhoven, with a very specific approach to the movie, while Bob is more like Miles Davis, a bit more like jazz. Q. What do you think that this film tells the audience? Michael Pena: To get involved, in whatever you see fit. Robert’s character pushes Todd to be involved. He doesn’t want him to go into the military, but to fight against that apathy. It’s not like during the ’60s or Vietnam where people were protesting, and kids were involved. Q. Do you think your character made the right decision in going to war? Michael Pena: That’s not for me to judge. I just look at him and wonder whether he made an honest decision about himself. It helped that I had friends who also made that decision, from the neighbourhood I grew up and from places in LA, where they’ve gone to the war. I was thinking of joining when I was 19, but I didn’t, obviously, I became an actor. It’s a good question, and I think that he made the right decision for himself. Q. Have your own feelings about the war changed much since making this film? Michael Pena: No, not really. I wish I had a smarter answer, but I really don’t know whom to believe. We’ve had faulty information — a point made in the movie — and it’s a case of who to believe and why to believe them? Who knows why those people did what they did on 9/11? Q. You said that you almost joined the army at 19. What appealed to you? Michael Pena: I was in the school cadets and we’d dress up and march and learn about the rifles. And the person who was running it suggested the military, and I thought about it for a week or so, just to myself. But after that week, the feeling never came back. Q. So does it now feel strange when you play a soldier? Michael Pena: Yeah. And in Babel for example, I played a border control guard, and that was interesting, because if someone like him had caught my parents, I probably wouldn’t be here today. But having been in the cadets for a couple of years, that I did help me with this. Q. Are you not tempted by doing a full on action blockbuster? Michael Pena: I’ve turned a few down. I turn down movies that I wouldn’t pay to go see. If it’s not going to entertain me then I have no business doing that movie. I did Shooter, but for me that was a real page-turner, and I felt that it had a political view about big business. But that was smaller, it wasn’t a $100million action movie. Q. What sort of military training did you receive for this role? 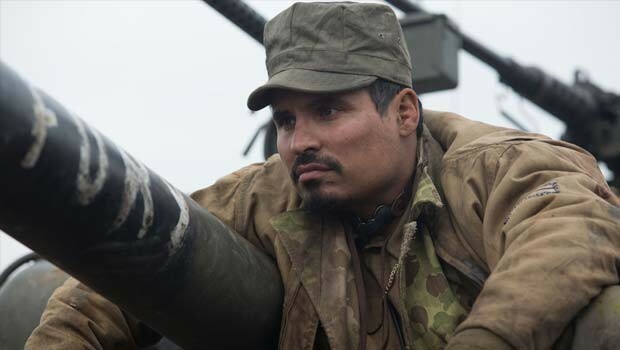 Michael Pena: The part where I was shooting and had to reload, that took a lot of training. It’s only three seconds in the movie, but it took me three weeks to learn how to do it. To me it’s one of those things that if it doesn’t look good in the movie, people will tell that I’m just faking it! We also talked a lot to a technical advisor, on how we stand and stuff. I also did some research on pain and consciousness. When the body is hurt like that, there’s a sleepy feeling, and pain helps you. You drift off, but then the pain shoots you up with adrenaline, and wakes you up a little more. Q. Was that similar to what you had to portray in World Trade Center? Michael Pena: No, that was more of a compression syndrome, when you’re very compressed and the pain is very different. It’s more of a dull pain, while this was very sharp. When I lift my leg to show how it is, it’s pretty serious. Q. The film is made of separate fragments, so how did you feel when you saw the finished piece? Michael Pena: Very happy. I think Tom Cruise gives a wonderful performance as this Republican senator. When I read it, I just saw a lot of facts, but Tom brought this honour to it, and there was an awesome dynamic between him and Meryl. And Andrew Garfield and Robert going at it, I was also pleasantly surprised. It was better than the script, and it takes a great director to do that. Plus it’s only 90mins long, and I really like that! Q. Did Robert make you fight hard to get the part? Michael Pena: Really, on the big jobs, like this and World Trade Center, I just met them and told them what I thought about the part. They said ‘Thank you very much’, no audition! But we were calling them constantly. With this I waited a month. I was with my manager at the time, and I was so excited, but it was in the same restaurant in which we shot that restaurant scene in the movie, which was kind of ironic. Q. Do you and your co-star, Derek Luke, have much in common? Michael Pena: We had to play buddies, so we hung out a little beforehand, and talked and had dinner with Bob and stuff. But he is very much a Christian and we’d pray before the scene. I never had done anything like that before, but he and his wife have these Bible classes at home. I went to his birthday party and there were people studying the Bible. I believe in God, but not to the extent that I pray every day. We did it every day for the duration of the three months, and in a weird way that’s how we bonded. Q. What was more exciting, acting opposite Robert Redford or being directed by him? Michael Pena: That’s a tough question, although actually when I was acting with him, I was also being directed by him, so I guess it’s the latter. It’s tough, though, because I grew up watching his movies and when he acts he makes it look so easy. I think he’s really under-estimated as an actor. I learned so much by him directing me. We’d come in the morning and we’d read the scene. He’d be very patient and just ask me what I thought about this and that, and we’d talk it over. I did my own study, but you also knew exactly what he wanted. It was a little odd though, because normally when you’re doing a scene with an actor, they don’t usually tell you what you to do! I think we only did the scene three times. He doesn’t want it to feel contrived. Q. Are you still in contact with [World Trade Center survivor] Will Jimeno? Michael Pena: I am. I talk to him every month. I want to get him down to the premiere for Lions for Lambs. He’s a really good guy, and a real-life hero. He doesn’t consider himself a hero, fire fighters and cops do things like that all the time, but he is. Q. Did your own upbringing in Chicago help you with this role? Michael Pena: When you start out there are stereotypes, and I played the ‘gang member of the week’ for three years. I was like, ‘How about I play a kid from college?’ And half the time it was going up against real gangsters – it was scary, man. But it’s always been an interesting ride; I didn’t go to college or anything, I just try and make the characters work. It’s helped me being raised by working class people, with very simple ideas and values. My father was a farmer. So it was always a case of keeping things simple for me.